Welcome to Janitorial Supplies 4 Less! We are a company that specializes in nothing but janitorial and industrial cleaning supplies. Our products are designed for professional, household, industrial and municipal users. Our mission goal is to supply the highest quality name brand janitorial supplies at the most economical cost and to provide a level of service second to none that will distinguish our company from the competition. Our promise to you is fast, efficient, and friendly customer support and service. We presently ship from over 26 fully stocked and geographically placed distribution centers to serve you efficiently and to save you on shipping charges. Most janitorial supply orders are delivered the next business day if your order is placed with us before NOON local time. Browse our complete line of brand name Janitorial Supplies, Cleaning Supplies, Maintenance Supplies and Sanitary Supplies by following any of the links in the category box to the left. We await the opportunity to serve you. Please feel free to call us if you have questions or need additional assistance with any of your janitorial supply needs. 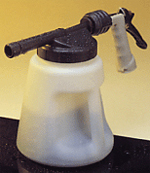 Contour™ Series Trigger Sprayer 8-1/8" Contour Trigger Sprayer Fits 24-oz. bottles. Case of 24. Polywool Dusters Plastic Handle Overall length 20".